Fuzzy Thoughts: Mr. Mitten's holiday give-away! Pensive, originally uploaded by mricon. I'm going to be giving away one custom-made portrait! I'm not a professionally trained artist, but I do enjoy putting pencil to paper every now and again. Since we're getting ready to welcome our first child into the big wide world, I think that "kids" would be a good theme for the giveaway. If you would like to enter the contest, send a short funny story about your child and a portrait picture you would like done to konstantin@fuzzymitten.com. 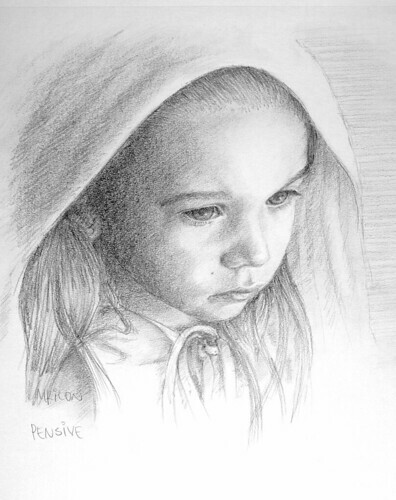 Drawing from photos can be a little tricky, so it's best if the picture is a studio portrait, or even just a high quality digital shot with good lighting. The deadline for submissions will be December 1st -- and I'll try to get the portrait done by December 10th so I can mail it in time. Posted by Unknown at 8:43 p.m. I have a funny story I want to share from my daughter... My daughter Donna told us she and her husband decided to go to church one Sunday. She has two boys, age 4 and 11 years old. Her 4 yr old son gets grouchy if he has to get up so early. Donna made her boys get up and get dressed for church. By the time they got to the church and were seated, this 4 years old grandson of ours announced really loud what time the show will start!! There were some people bursting into laughter! November 24, 2008 at 12:05 p.m.